What is the extent of extreme poverty in Greece? A new diaNEOsis study calculates the effective extreme poverty threshold for Greece, estimates the number of Greeks earning less than that, and arrives at a series of proposals aiming to drastically alleviate the problem. The problem of poverty is not something unique to Greece. The country is facing one of the greatest economic crises in the history of mankind, but poverty and inequality are universal problems. Even some of the wealthiest countries in the world face them. However, Greeks lost one third of their purchasing power and a quarter of their income during the first half of this decade. This must surely have made poverty a much graver problem here. But how much graver? The aim of this study is to map the problem of poverty in Greece, and to arrive at concrete solution proposals. But mapping such a problem is not easy. What is the definition of poverty, exactly? Who counts as "poor"? In recent years, the vast majority of Greeks have seen their income shrink, due to the reduction of their salary or pension, or due to unemployment. In 2014, 95% of Greeks stated that "they find it difficult to cope, financially." But how many of them are truly poor? How many are destitute, struggling to survive? And what can be done to help them? Our study is comprised of a policy paper, authored by professor Manos Matsaganis, Dr. Chrysa Leventi, Eleni Kanavitsa and Maria Flevotomou, and an independent public opinion survey, conducted by the University of Macedonia on behalf of diaNEOsis. Both the paper and the survey data are published in Greek and can be found here. This is a summary of the main findings. In order to combat extreme poverty it is not sufficient to, say, construct a new productive model for the economy, or to implement extensive educational reforms. 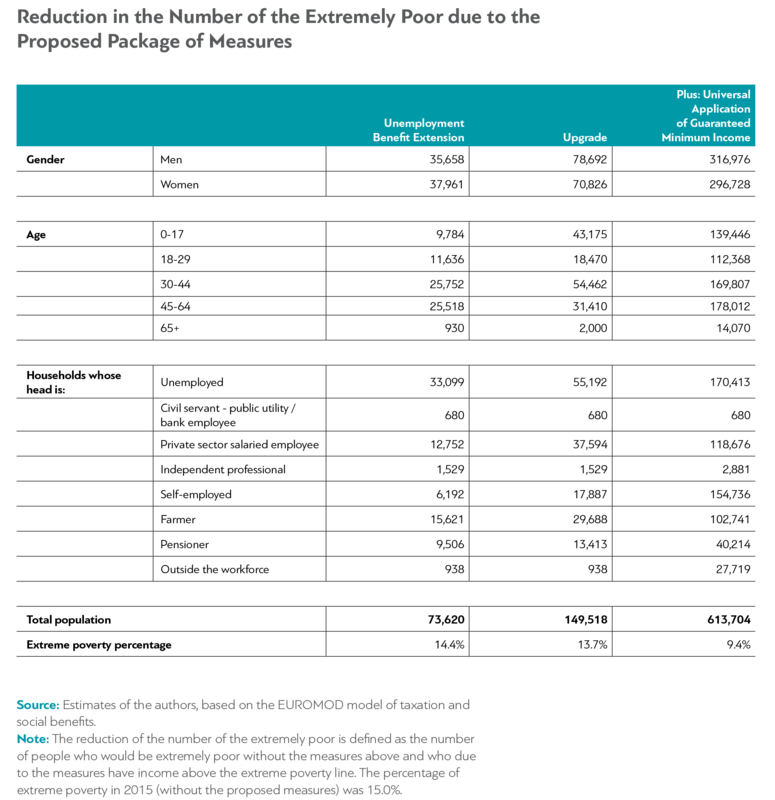 These are essential policies for any government facing an economic downturn and rising unemployment, but they cannot be immediately effective as measures against poverty. The main reason is timing: People living in extreme or absolute poverty need support now, not in the near or far future, when complicated economic or educational initiatives bear fruit. It has been well documented that the easiest, most effective way to help them is to create a fair system that provides them with the main resource they lack: Money. The fight against actual, extreme poverty probably was never a main priority for the Greek state. For a very long time, spending on social welfare in Greece remained at levels similar to the rest of the European Union. However, as our data shows, this did not provide adequate levels of protection for the weak. There were significant gaps which, after the onset of the economic crisis, have widened. The truth is that the fight against actual, extreme poverty probably was never a main priority for the Greek state. But what do we mean when we say "poverty"? 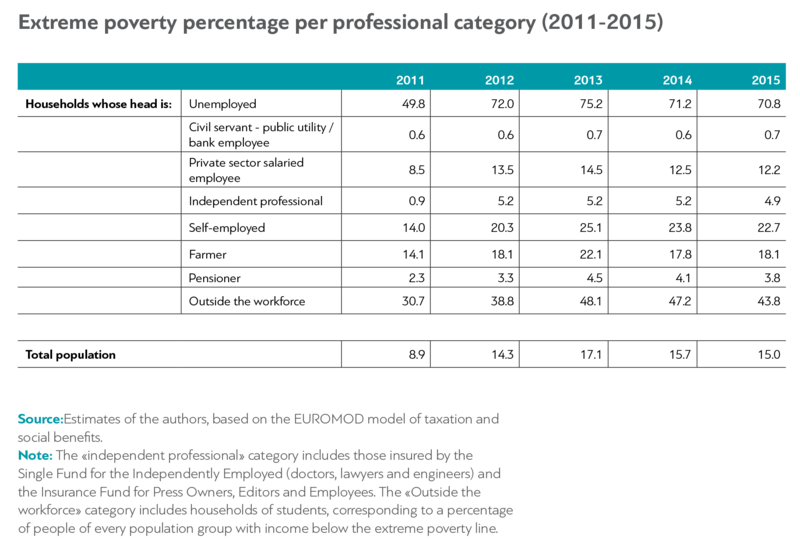 To measure poverty, official statistics in Europe use a metric called "relative poverty". People living in relative poverty have income that is lower than a set percentage of the economy's median income. In Europe, the relative poverty threshold is currently set at 60% of median income. This means that the rate of relative poverty is equal to the percentage of people who have income less than 60% of median income. ("Median income", by the way, is the income of the median individual, i.e., of the citizen exactly in the middle of the income distribution. People who are richer than the median individual are exactly equal in number with those who are poorer). This is of course an arbitrary limit. It is used mainly to show how many people are significantly below an "average" standard of living, but it tells us nothing about whether these people actually face problems of survival. It does not tell us whether they are genuinely "poor". It only shows us that these people find themselves noticeably below the average household’s living conditions. This is why the rate of relative poverty is not greatly affected by a country’s economic status. During the euphoric growth of the 1995-2008 period, for example, relative poverty in Greece remained almost stable at around 20%. After the outbreak of the crisis in 2010 and the unprecedented recession that followed, it barely increased. To identify people who are actually poor and help them, we must define "extreme" or "absolute poverty", a metric that is much more meaningful in this context. And it is not enough to know how many Greeks are below poverty line; it is also necessary to know how close to the poverty line these people are, to measure the so-called "poverty gap". We need to calculate how many people are poor, but also how poor they are. Our researchers used EU-SILC (Survey on Income and Living Conditions in the European Union) as a source for income data, as well as EUROMOD, a tool used to calculate the impact of taxation and social policy measures in European economies. 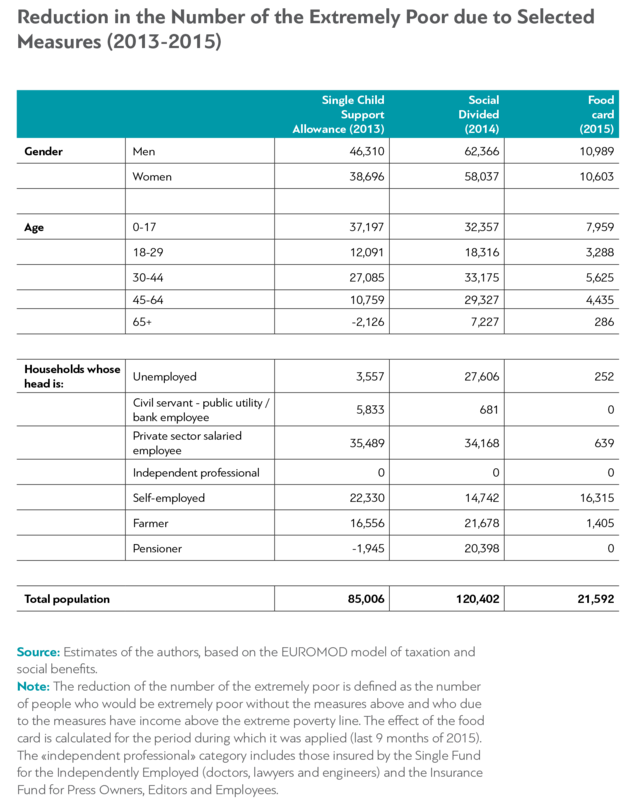 EUROMOD uses EU-SILC data from 2011, so our team used micro simulation to update its dataset. Download the .xls files with the “basket” of goods and services designed by the survey team (In Greek). Then, the team calculated the cost of a "basket" of products and services that a Greek household must be able to afford each month to survive. The value of the basket differs depending on the location of the household, its size and composition, as well as whether members live in a privately owned home or pay rent or mortgage installments. "The extreme poverty threshold" is defined as the monthly cost of this basket, which corresponds to the minimum subsistence needs. Naturally, the decision on what must be included in this basket is subjective. For example, our basket does not contain the monthly cost of a telephone landline, because our researchers agree that use of a landline is no longer absolutely necessary to survive. The basket does, however, include the cost of mobile phone usage. 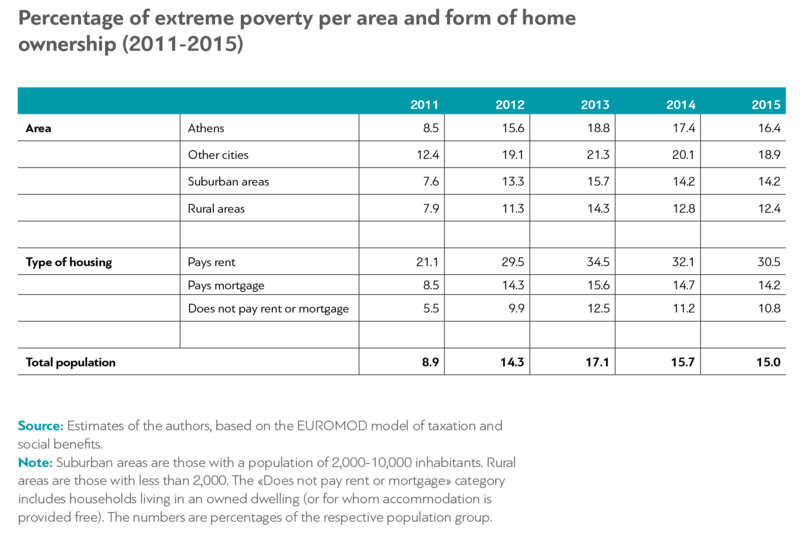 As you can see, the extreme poverty threshold in Greece ranges from €182 per month for a single member household in suburban or rural areas living in a privately owned home, up to €905 per month for a couple with two children living in Athens and paying rent or a mortgage. How many have monthly income below this threshold? The percentage of extreme poverty in Greece for 2015 stands at around 15%. In 2011, the percentage was 8.9%. In 2009, it did not exceed 2.2%. Analyzing the detailed results, we see that the percentage of extreme poverty among children (17.6%) and young people aged 18-29 (24.4%) is impressively high, while only 2.7% of the population aged over 65 have monthly income below the threshold. Families without children face lower extreme poverty percentages than families with children, but families with three children seem to be in a better position than those with one or with two. Families who rent show a higher extreme poverty percentage than the vast majority who live in their own home without a mortgage (30.5% versus 10.8% in 2015). The group that is most at risk of all are, of course, the unemployed. The percentage of extreme poverty in the unemployed in recent years stands at around 70-75% - compared to less than 50% in 2011. In contrast, less than 1% of the families of public sector employees live under the extreme poverty threshold. The respective percentage for pensioners is also very low (3.8%). These findings are explained by the fact that the reductions of low pensions in the crisis were much lower than the reductions affecting other income categories, while even the lowest pensions are paid regularly, and as a rule are sufficient cover the cost of our "basket" with euros to spare. However, to be fair, the conclusion should also take into account the cost of health services for the elderly, which have not been taken into account in the design of the basket (health care is theoretically free for insured tax payers and pensioners in Greece). In most cases health care is most certainly not free for the elderly, therefore, although pensioners' incomes are generally higher than other categories, their standard of living may not be. And what do Greeks think about the issue? Our public survey aimed to gauge public perceptions about poverty. 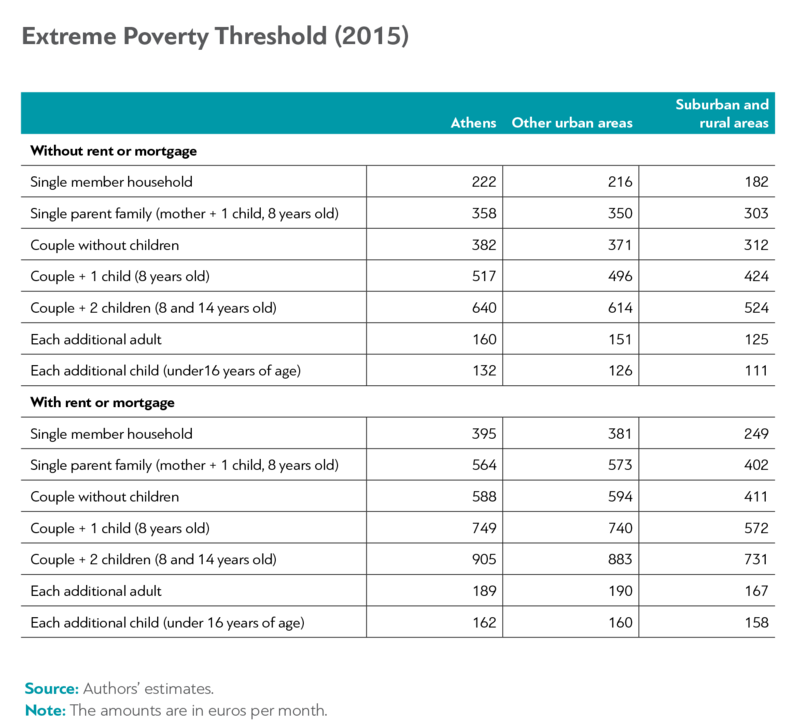 As expected, the picture citizens have of "extreme poverty" is quite different than what our data came up with. When asked about what their limit of absolutely essential household expenses would be, the average response came at 1,430 euros - a sum much higher than the extreme poverty threshold of all categories of households. Still, the most striking number that came out of our study must be this: 1,647,703. That is the actual number of citizens that, according to our calculations, earn less than the extreme poverty limit each month. That is 15% of the population in 2015. How do all these people survive? Some of them may still have savings with which they cover the poverty gap (savings are not reflected in the income). Some others may simply leave bills unpaid (rent, utility bills, credit cards). There is data to confirm this: According to Eurostat, the percentage of the poorest 20% of the population that had unpaid rent or mortgage installments in 2014 had reached 27.1%, while the percentage of the same poorest one-fifth who had left utility bills unpaid had reached 65.4%. Some of them, however, are already facing a serious survival problem. We asked our researchers to evaluate current welfare policies and to come up with new proposals that would have a measurable impact on the problem. 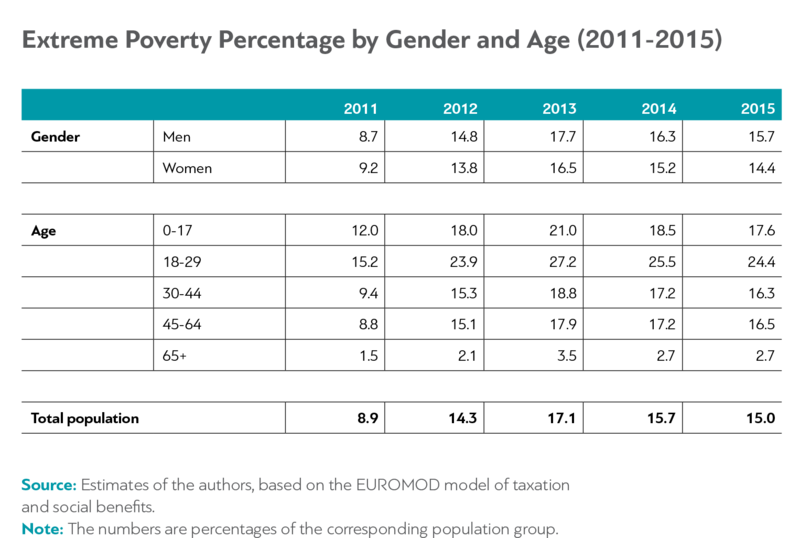 Anti-poverty policies in Greece have been traditionally characterized by the lack of effective targeting. Housing policies, for example, have historically led to one of the highest percentages of home ownership in Europe (72%), but have traditionally benefited families that are not poor. During the crisis, as the number of the unemployed doubled, the number of unemployed benefit beneficiaries fell by half. In 2015, fewer than one in ten unemployed people were receiving unemployment benefits. In 2010, welfare expenditure in Greece had reached close to the average of the EU countries (29.1% of GDP compared to 29.4%), but while social transfers in the EU reduced poverty by 9.5%, in Greece the corresponding figure was just 3.9%. Of course, political efforts have been undertaken during the crisis. Our team of researchers evaluated three of these policies: The social dividend (2014), the child support subsidy (2013) and the food coupons (2015). These measures had mixed success. The social dividend (2014) reduced the number of people who were below the extreme poverty line by 120,402. The child support subsidy (2013) helped 85,006 people. The food coupons (2015) contributed less: The policy pulled 21,600 people out of extreme poverty. However, this particular measure did decrease the poverty gap (i.e., how far the income of the poor household is from the extreme poverty line) at a percentage comparable with that achieved by the other measures. Overall, however, the success of these measures was limited, and the vast majority of the extremely poor remain below the limit. Our researchers propose the adoption of three realistic programs that would decrease the number of citizens living below the extreme poverty line by 614,000 at an annual cost of 2.7 billion euros (1.5% of GDP). The extension of regular unemployment benefits. Expanding the child support subsidy. Expanding the Guaranteed Minimum Income (GMI) to cover the entire country. Today, only 9.5% of the unemployed receive the standard unemployment subsidy, while very few long-term unemployed are entitled to receive long-term unemployment benefits. The standard subsidy is only offered for a period that does not exceed 12 months. We propose the extension of that period as needed to cover up to 40% of the unemployed. The child support subsidy has been given to low-income families since 2013. We propose its increase from €40 euros per child per month to €60. It's a small increase and an inexpensive measure, but the data shows that it can benefit extremely poor households immensely. A recent limited GMI test program in Greece was a success. We propose its expansion across Greece, with small but key changes in its design. If these relatively simple measures were implemented, about one million poor citizens would benefit, and 613,704 of them would see their incomes rise above the extreme poverty limit. The percentage of extreme poverty in Greece would fall from 15% to 9.4% of the population. One million citizens would remain below the threshold, but their incomes, too, would be increased - the poverty gap for them would be reduced by 55%. Of course, these programs would cost €2.7 billion, a stunning amount of money. Still, there is a question of priorities. Our country spends nearly €2 billion every year on pensions for citizens below the age of 55. The total public welfare benefits for 2015 did not exceed €700 million, with €220 million going to beneficiaries who were also receiving a pension. Money is an issue these days, but limited resources should go first to those who need them most. Why isn't this happening already? Because the vulnerable, the unemployed and the poor are not only financially and socially weak - they are also weak politically. The political parties are usually more willing to provide support to groups that yield greater political influence (public sector employees, farmers, pensioners) than to the invisible, politically non-existent extreme poor. This reality was easier to ignore before the crisis, when the extreme poor were few (a mere 2.2% of the population in 2009) and, therefore, even more invisible. Today they are not invisible. We cannot afford to ignore them anymore.